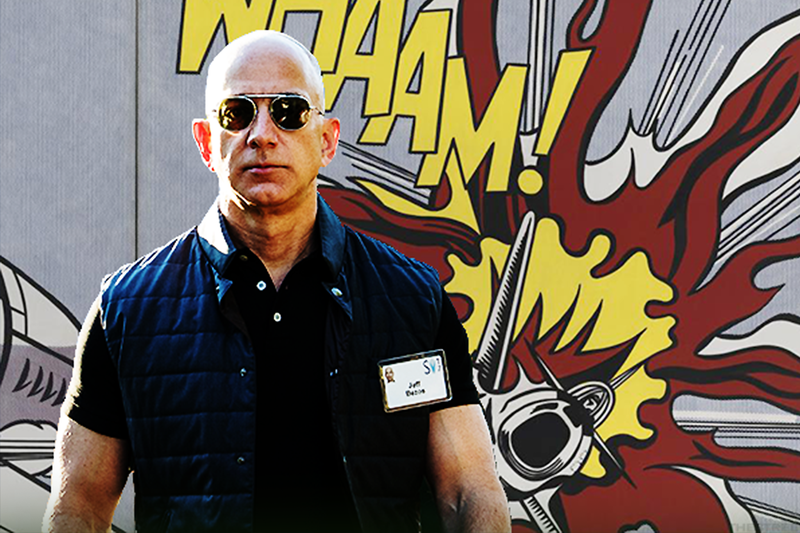 Everybody needs a hero, even tech entrepreneurs. A few years ago, it was Uber that seemingly every startup on the block wanted to be like. For a time, every aspiring market disruptor seemed to advertise itself as the 'Uber of X', which usually meant that with a push of a button, customers could summon whatever they wanted -- be it a massage, a laundry courier, a lawn care specialist, or some medical marijuana. But as scandals escalated at the ride-hailing giant and investors questioned the feasibility of 'on-demand' models for every imaginable product or service, Uber fell out of favor as the lodestar of every founder. The new glittering beacon of success in Silicon Valley is a 24-year-old, Seattle-based company that started out as a book seller: Amazon (AMZN - Get Report) , which became the second company after Apple (AAPL - Get Report) to cross a trillion-dollar market capitalization this week. Everyone wants to be like Jeff these days. Ironically enough, even Uber CEO Dara Khosrowshahi -- who himself has steered an impressive turnaround after taking over from Uber's ousted founder Travis Kalanick -- has cited Amazon as Uber's True North. "We want to be the Amazon of transportation, any way that you want to either move around or move things or food around in an urban destination," Khosrowshahi said at the TechCrunch Disrupt conference in San Francisco, an annual gathering of investors, startup founders and other tech luminaries expounding upon the state of innovation. What's behind the Amazon obsession? Clearly, the astronomical success of the retail and logistics giant plays a role. Since the beginning of 2017, the value of Amazon's stock has increased more than 170% and now trades at just shy of $2000 per share. It's the second most-valuable public company in the world, and one with tentacles just about everywhere, from AWS, its market-leading public cloud, to gaming, hardware, and even Hollywood through Amazon Studios, all in addition to its delivery business. But if you ask other leaders what they admire about Amazon, they invariably cite its "customer obsession" -- one of Amazon's enshrined corporate values. Dheeraj Pandey, CEO of cloud firm Nutanix, recently told me that he found inspiration in Amazon's organizational efficiency and relentless customer focus: "It's organizational design that's amazingly well done, and they're customer-obsessed because they come from a retail background," he said. As founder of Ring -- the home security startup that was acquired by Amazon for more than $1 billion in April -- Jamie Siminoff said at the conference that Amazon's relatively low-touch approach to its acquisitions was a selling point. "I still go to work every day and do what I was doing, and that's great," Siminoff said. No doubt, it's the dream of every exiting founder make a mint, and to see their business continue to grow, unfettered by new corporate ownership. As for where the next great company might be founded, much like Amazon, it may not spawn from the classic entrepreneurial meccas of Palo Alto or San Francisco. Whether that's a fintech company in Columbus, Ohio or an A.I. app built in China, Silicon Valley's recent history also features plenty of cautionary tales. Two salient examples are Facebook (FB - Get Report) and Twitter (TWTR - Get Report) -- once high-flying social media firms that have suffered punishing criticism for their handling of abusive content, foreign interference and related issues. As part of the continuing scrutiny, Facebook's Sheryl Sandberg and Twitter's Jack Dorsey testified on Capitol Hill this week on election integrity, censorship and other issues -- and the testimony sent Facebook and Twitter shares slumping even lower. "You should think about, well, which risks can I reasonably see from here, and can I try to address them?" said investor Reid Hoffman at the conference, speaking of Facebook's and Twitter's foibles and of the need to scale responsibly. The moral of the story is that growth comes at a price -- in Facebook's case, it was misusing user data, ignoring suspicious foreign activity and an inability to keep up with fake news and abusive content that finally came back to bite them. No such hubris has befallen Amazon's Jeff Bezos, at least not yet. So tah-tah, Travis. Sayonara, Zuck. There's a new champion in town, and it's a bookish, customer-obsessed 50-something -- who just so happens to be the wealthiest person on the planet. Facebook and Amazon are holdings in Jim Cramer's Action Alerts PLUS Charitable Trust Portfolio. Want to be alerted before Cramer buys or sells these stocks? Learn more now.